“Faith Matters” goes deeper into spiritual, sacramental and liturgical life at St. Bride’s. In this area you will find links to Masses, Holy Hour, the Rites of the Church, thoughts on the Exposition of the Blessed Sacrament and Festivals and Holy Days. There are also links to guides used in Advent and Lent - as well as all the content created for the Year of Faith. The current banner on this page is “The Annunciation” by Henry Ossawa Tanner (1859 - 1937). Tanner was an African-American painter whose later paintings were mainly focused on religious subjects. 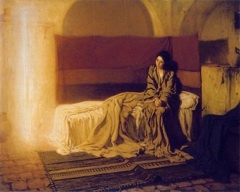 “The Annunciation" (1898) considers the transcendence between the divine and humanity. Redemptorist priest, Denis McBride, juxtaposed the painting with a poem, “The Virgin” by Liverpool poet, Holly Green. Please click on the painting to view it in greater detail and to read Holly Green’s poem. The Year of Faith was declared by Pope Benedict XVI to coincide with the 50th anniversary of the opening of the Second Vatican Council and the 20th anniversary of the declaration of the Catechism of the Catholic Church. Its purpose was to encourage Catholic Faithful to rediscover the gift of faith and to seek new ways of proclaiming it - echoing the call of Pope John Paul II to a “New Evangelisation, one that is new in its ardour, new in its methods, and new in its means of expression." In the course of the Year of Faith, we published thirteen newsletters on subjects ranging from “The New Evangelisation” to “Handing on Your Faith”. Pope Benedict XVI set aside a special year for Catholics throughout the world to rediscover, and share with others, the precious gift of Faith. In 2014 the ecumenical Lenten Talks will be held in the United Reformed Church at 11 Old Coach Road, East Kilbride - hosted by the Rev Lyndsey Sanderson. This ecumenical study group which meets on Sunday evenings throughout Lent. We’ll provide more details of this year’s programme nearer the time. In this section, you can find aids used in study groups for Lent and Advent in 2011. The Gospels of Matthew and Luke begin with THE INFANCY NARRATIVES - stories of Jesus’ conception and birth. On Sunday 6 March 2011, around fifty people from the parishes participating in Lenten Studies, gathered at St Bride’s for an initial service of preparation. The links here are to the material which was used throughout Lent 2011. A reflection by Father Denis McBride. What new possibilities are opened up to us when we “step out of our bubble” or let someone else in? This scene is set at Jacob’s well. Whoever owns the well is a keeper of life; whoever has access to the well has admittance to new life. When we hear the word “transfiguration“ in a religious setting, most of us immediately think of this dramatic story: the transfiguration of Jesus. Jesus leaves all behind him and takes to the road. He says goodbye to everything familiar to him, leaving it all over his shoulder. The story of Emmaus is unique because it is the only narrative that allows us to listen to how Jesus’ disciples interpret his death immediately following the event. Father Denis McBride is a Redemptorist priest from Scotland who is now Director of Redemptorist Publications. In his post-graduate education he first studied psychology at Fordham University and then the New Testament under the great scripture scholar Raymond Brown at Union Theological Seminary, New York. After winning a scholarship to Harvard University, he returned to England to work at Hawkstone Hall, the international pastoral centre in Shropshire, England. Each year, the Christian community of East Kilbride comes together on Sunday evenings throughout Lent. In these gatherings, we explore the themes and messages of Lent in a spirit of fellowship. In 2011, it was St Bride’s turn to host a group consisting of fellow Christians from the Old Parish, the West Kirk, Stewartfield Church and the United Reformed Church. We followed “Journeying with Jesus: a companion’s guide”, written for groups, by Father Denis McBride.